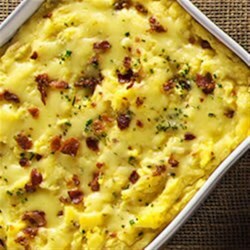 "Mashed potatoes with Cheddar and cream cheese, sour cream, and bacon make a rich, delicious side dish." Preheat oven to 350 degrees F. Peel potatoes, and cut into 1 inch chunks. Place in a large saucepan, (remove comma) and add enough cold water to cover by about 2 inches. Bring to a boil over medium-high heat, then reduce to a simmer. Cook until tender, about 20 minutes. Drain potatoes, return to pan, cover, and set aside. Meanwhile, heat a large skillet over medium heat. Add bacon, and cook until crisp and browned, turning once. Transfer to paper towels to drain; let cool, and crumble into pieces. Using a fork, mash the potatoes in pan until light and fluffy. Add the cream cheese, butter, and sour cream, and stir until combined and smooth. Add the chives, 2 cups cheddar cheese, half the bacon, salt, and pepper. Stir until well combined. Transfer to a buttered 3 quart baking dish. Top with remaining 1/2 cup cheddar cheese. Bake until top is slightly golden and potatoes are heated through, about 30 minutes. Remove from oven; garnish with remaining bacon. Serve immediately. My son liked it but the rest of the family could care less. I didn't have the garlic cheddar, so I fried up some garlic with the bacon instead. Keeper recipe! Did not have bacon, substitute with pepperoni, still taste marvelous. Will make it again. This is a fantastic recipe! 5 stars without a doubt!